Disclosure: Party of 5 received complimentary tickets and a hotel stay in order to bring you this review. All opinions are my own. 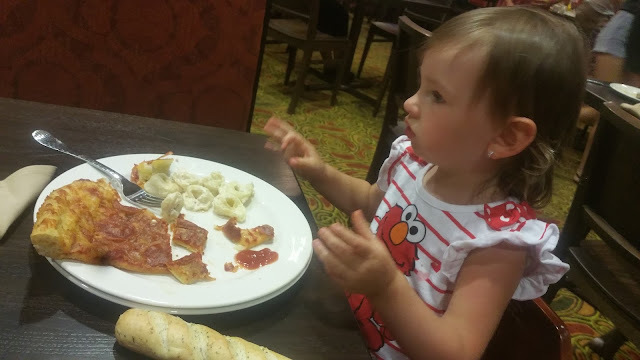 Last month Party of 5 had the opportunity to stay at the newly completed Camelback Lodge and Aquatopia Indoor Waterpark to continue the fun during out summer break. We kicked off our trip by hitting up Camelbeach for some outdoor waterpark fun. The younger kids had a blast splashing around in Pharoah's Phortress using the 8 waterslides, giant tipping water bucket and the small pool. This is where the littles spent most of the day. A great thing about this location is right in this spot you can get lunch or dinner and drinks for both adults and kids. The bigger kids ventured around hitting up the big waterslides and the Kahuna Lagoon. Camelbeach has something for everyone of all ages and is surrounded by beautiful scenery. The kids and adults had a blast and look forward to coming back again next year. Camelbeach is the perfect vacation spot for us as well as being very affordable. Pricing for an adult is $37.99 and $27.99 for kids under 48 inches tall. 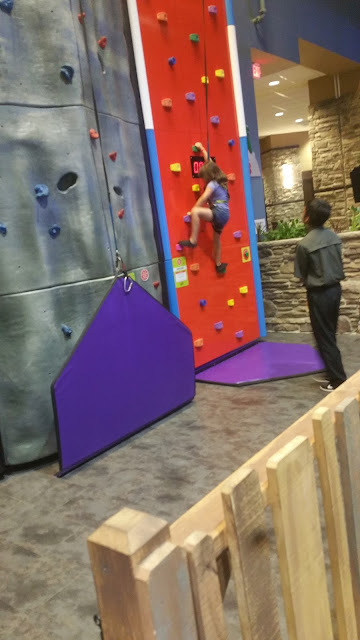 After we spent the day at Camelbeach, we headed over to the newly completed Camelback Lodge and Indoor Waterpark for some more fun. 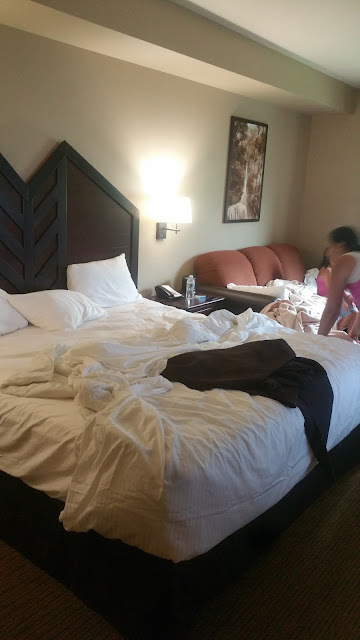 After checking in to our King Bunk Suite and getting settled in for a bit we headed downstairs to check out all of the ammenities Camelback Lodge has to offer. With several dining option, a spa for both kids and adults, an awesome game room, an outdoor patio and plenty of activities to keep the kids occupied. We started off with diner at Hemipsheres, where we enjoyed an amazing buffet dinner with all of the options you could image. 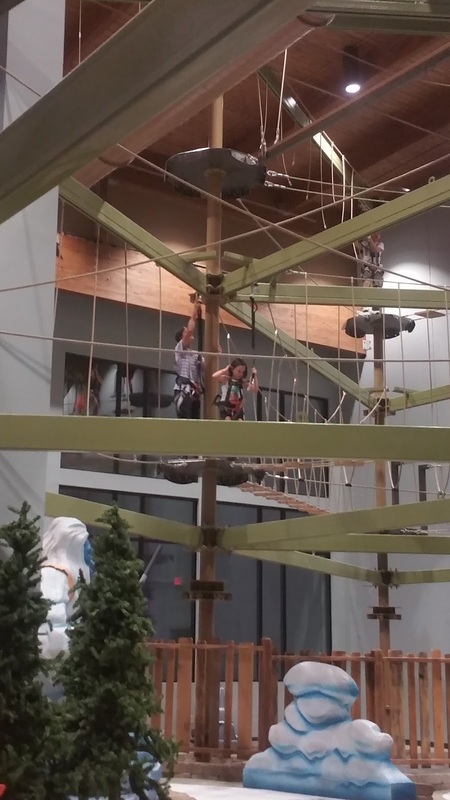 After dinner, the kids checked out the indoor tree top adventure course. and the rock walls. The kids had a blast climbing walls, walking the indoor rope course and just being kids. The adults had a great time with a cocktail from Neptunes. Let's talk rooms now. Our King Bunk Suite was absolutely amazing. 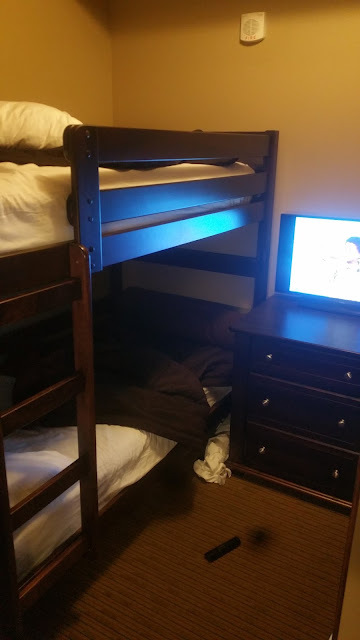 With 4 bunk beds in one room and a king size bed with a pull out couch in the other there was plenty of room for my family of 6. I loved that the kids had their own little room with a tv so once they went to bed the adults didn't have to. Even though CamelBeach is closed for the season, The Camelback Lodge & Aquatopia is still open. I highly recommend a stay this fall/winter season. I guarantee you and your kids will have a super fun and memorable time.